Tuesday: I had planned to run after work with the Oiselle Volée (if you missed it, I just recently joined the Minnesota ‘flock!’). Unfortunately, the event was postponed as most of the members had just returned from “Bird Camp”, a 3-day running camp with all the national Volee runners (It sounds like it was a blast, I can’t wait to go next year!) I didn’t see the cancellation on Facebook until the morning when I was on my way to work, and I had already made arrangements to ride into work with Dustin and have him ride the bus home so I could drive to the event after work. Oh well. Just meant I was on my own for a post-work run! With the change in plans, I decided to do my short speed workout that was on my schedule at the Southwest High School track like I did last week. I jogged over there (about 1 mile) and there was a soccer game going. No-go on the track for me. Darn! Just had to do the 200m repeats on the trail instead. 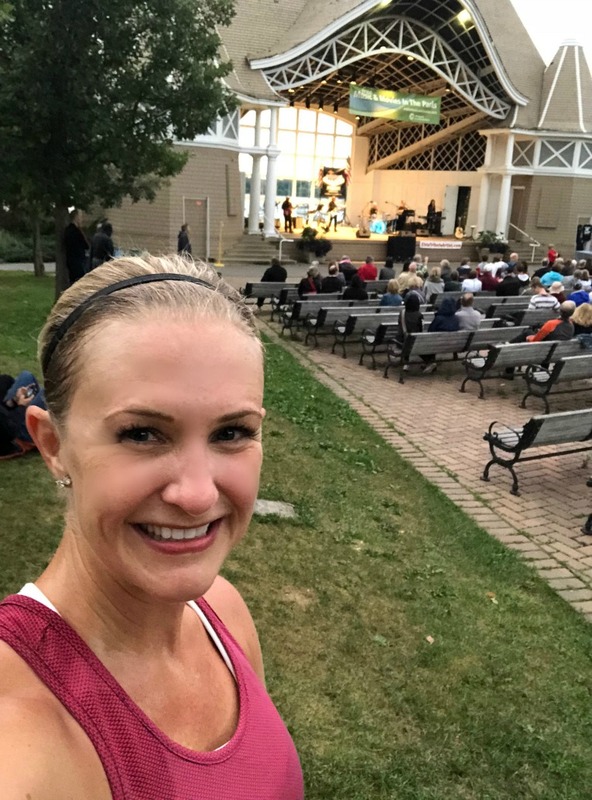 I did pause my run for a quick break by the Lake Harriet bandshell, where an Elvis impersonator was performing! Funny. 8 miles total for the day. Wednesday: Morning run commute, 7.6 miles. 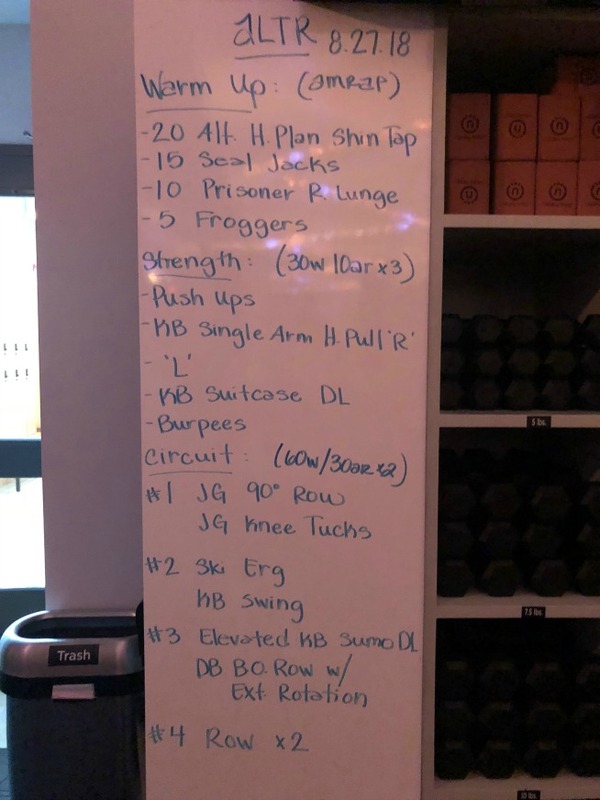 After work, I walked over to ALTR for a 6:30 pm 50 minute HIIT/strength class. Always excited to squeeze in a second strength class when I can! Friday: I had 30 minutes of easy running on my schedule, which I decided to do after work in the heat. After a quick run, I zipped to the vet to pick up Matilda, who had her teeth cleaned. Since they had to put her under with anesthesia for that, they also removed a small cyst on her belly. Poor thing was pretty loopy when we picked her up that evening, but she’s recovering just fine! She was feeling like her normal self by the next day, which was great as we were dog-sitting my friend Vicki’s golden retriever Breck for the weekend. They are so cute together! Saturday: 12 miles! My longest run post-broken leg. I ran two miles, and then met up with my friend Monica for 10 more miles. I started at 7 am but it was already so hot and humid. We took plenty of walk breaks and water breaks as it was a doozy, but it was so great to have that dedicated time to catch up with her. We hadn’t run together since 2016! I feel like I’ve been making my rounds with running friends, trying to make up for lost time; the social part of running is definitely something I missed! Running in that heat really wiped me out…Dustin too! He had a 20 mile training run for the Twin Cities Marathon. 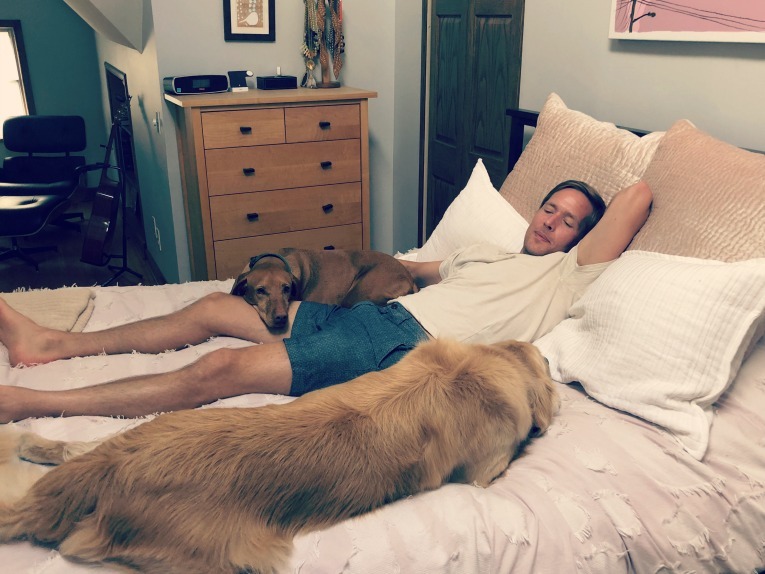 As you can see, everyone was just a little tired Saturday afternoon…. 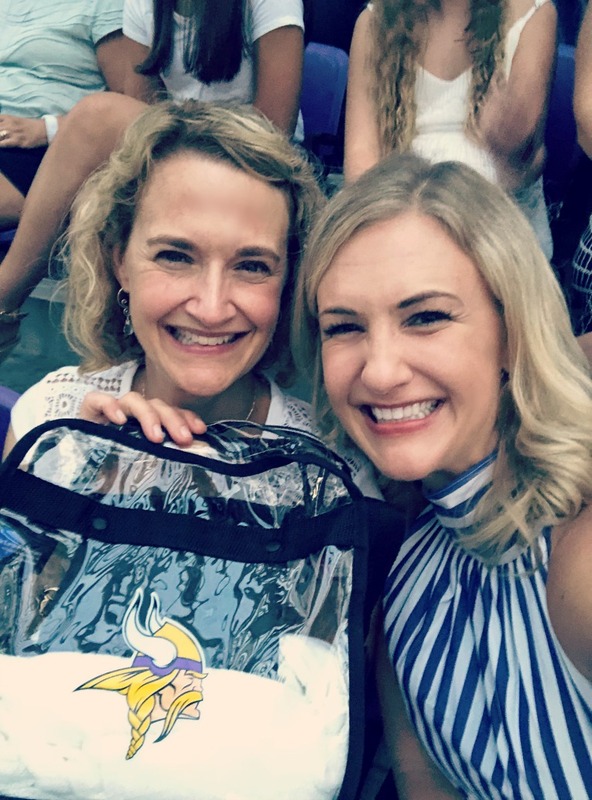 But by Saturday night, we rallied to attend the Taylor Swift concert at the US Bank Stadium with my sister and two of my nieces. It was very entertaining- she puts on quite a show! We all had a great time. 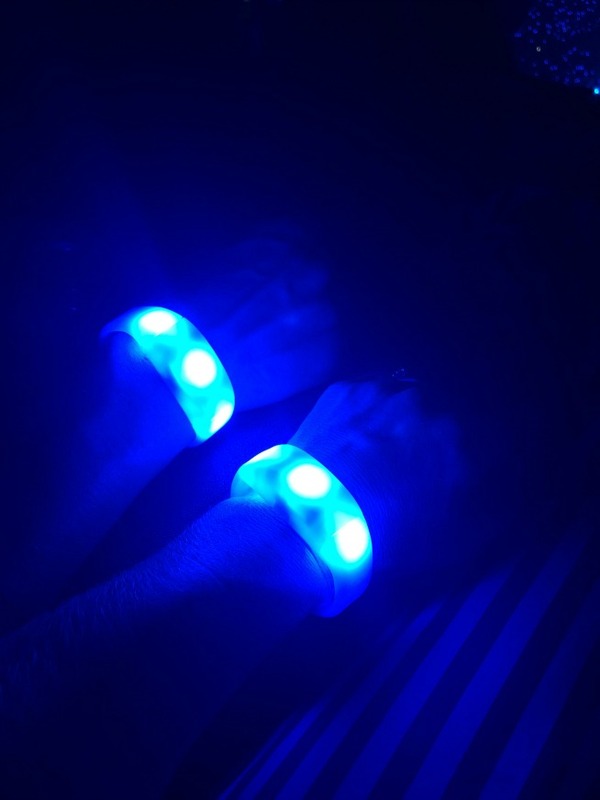 Every concert attendee received a bracelet upon entry that would flash and light up different colors to go with whatever song Taylor was singing. It was a pretty cool effect to have the whole stadium lit up at different times! The technology was very impressive. Sunday: After a later night at the concert, I slept in a bit. Eventually I ran 4 miles with Dustin. Even though a storm rolled in this morning, it was still so humid for our run…yikes! I feel like I spent the whole rest of the day trying to rehydrate! Summary: About 42 miles of running, 2 strength classes, lots of walking of the dogs and lots of walking at the fair! As I mentioned in last week’s recap, the Minnesota State Fair is a huge deal. 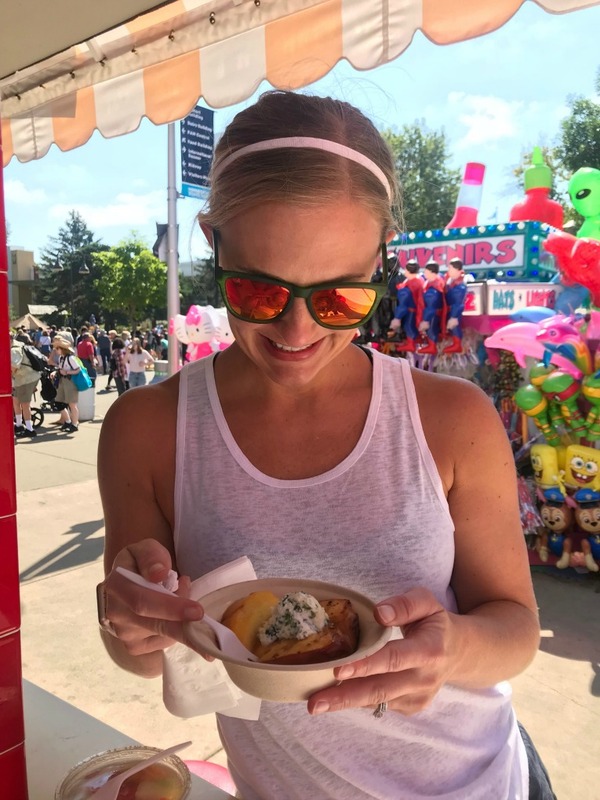 It’s not just fair food, but rather has become a bit of a ‘foodie’ scene with new dishes added every year. It’s also pretty normal for people to take time off of work to attend, like we did. 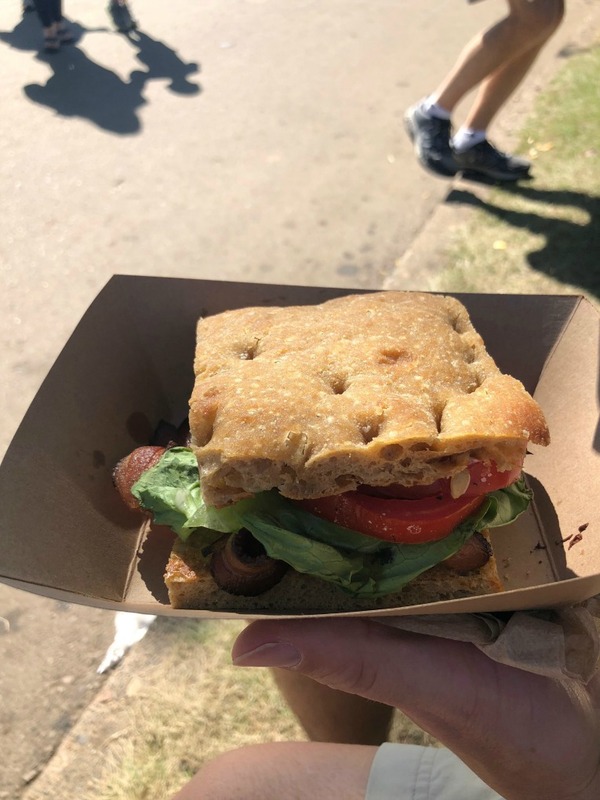 There was a lot of other delicious food eaten during our day there, but one of my personal favorites was this heirloom tomato sweet corn BLT from the Farmer’s Union Coffee Shop. So good! It is so great to go to the Fair during the week when it isn’t quite as busy; the weather was also wonderful on Thursday for wandering around the fair. Dustin’s Garmin said we walked about 7 miles. That does seem really high, but we were there from about 9:30 am until 6 pm, so I guess it’s true! Dustin tried the Rainbow Cloud Roll, which was definitely the least healthy thing we tried. 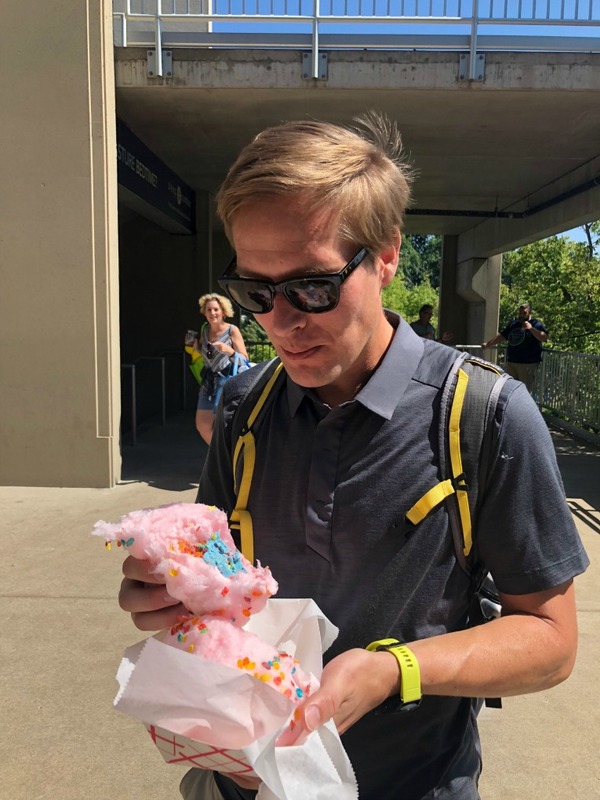 It was three scoops of ice cream with Fruity Pebbles wrapped in a pillow of cotton candy. I tried a few bites and it wasn’t as bad as I thought it would be, but a few bites was all I needed! 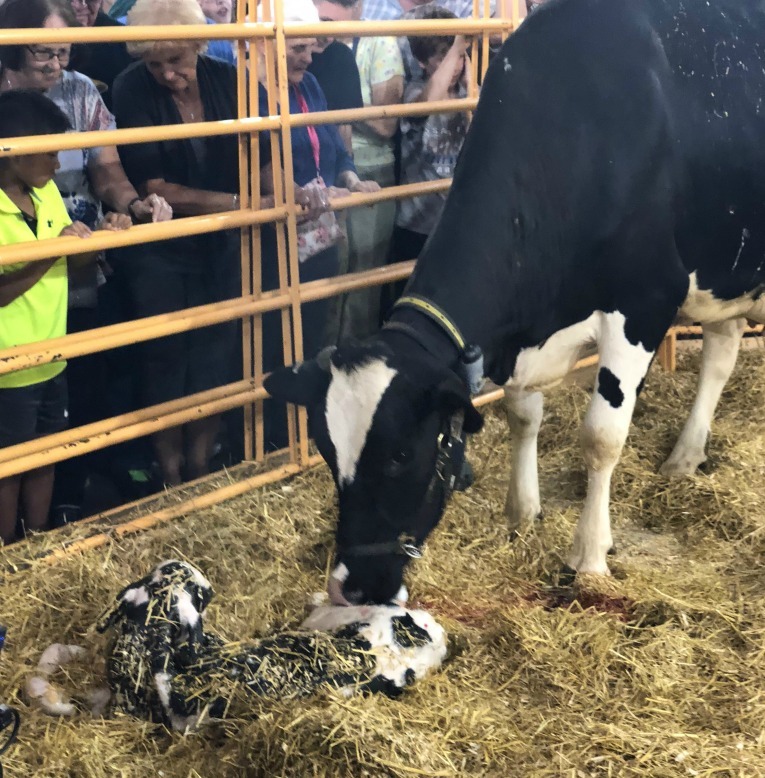 After all my years of going to the fair, this was the first time I witnessed a cow giving birth in the Miracle of Birth center. Graphic, but fascinating! I also always enjoy the crop seed art in the agriculture building, like this one. Minnesotans sure loved that MPR Raccoon! A fair day is never complete without a visit to see the alpacas! Well, that’s a wrap! I guess it was a pretty busy week, but I’m happy with how my running went. My pace is still much slower than it used to be, but I’m running consistently and really happy about it! As Des Linden says, you just have to keep showing up. I’m getting out there and doing the work, and hopefully the speed will come back with time. 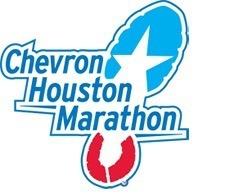 Congrats on your 12 mile run! I miss running with friends but haven’t been able to get our schedules synched up in a while. Those grilled peaches sounds amazing. 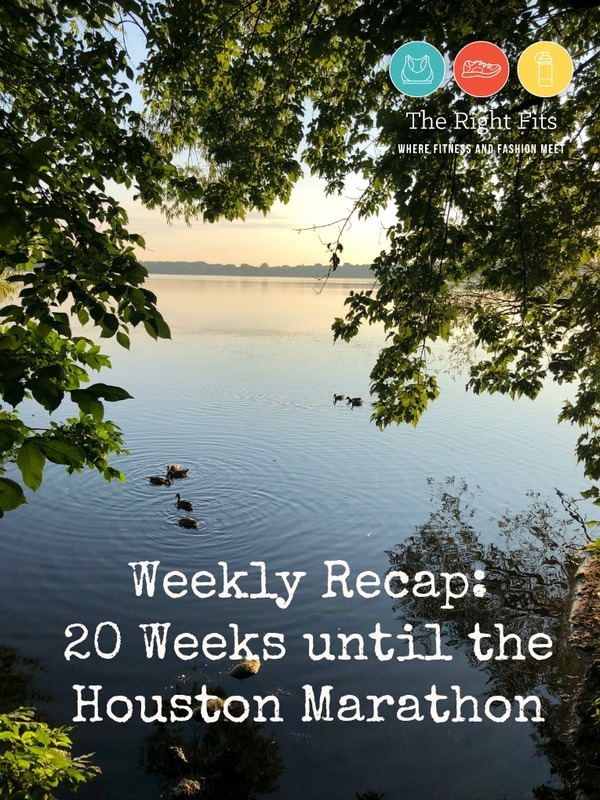 Great news – way to go on the 12 miler. MN weather is really tough right now. Is the new coach still working out great? She is! It’s still very early, but I think she’ll be great 🙂 I have a long time before Houston to really get back to it. 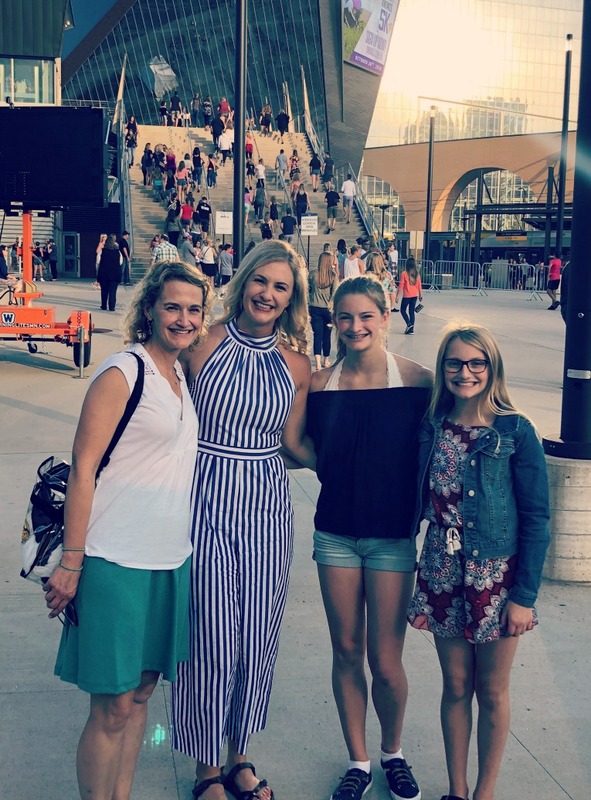 I took the oldest daughter to see Taylor Swift 10 years ago…she was fabulous then, I can only imagine how much better her shows are now. She’s a talented gal! As you know, state fairs are BIG. A lot of people take time off work here, too (like an entire week of vacation!) to hang out at the fair (it’s an hour away from my town). Yes, state fairs are a big deal in Texas, Iowa, and Minnesota, ha! It’s just so great to see you piling up the miles! What a great comeback. You, your sister, and your nieces all have the same smiles! You guys are so cute! Congrats on another awesome week of training! How many people can say that they saw an Elvis impersonator on their evening run, lol. Awwe poor Matilda 🙁 I am glad that she bounced back quickly and is feeling better! 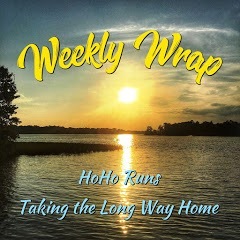 Congrats on the 12 miler and a great week of workouts! 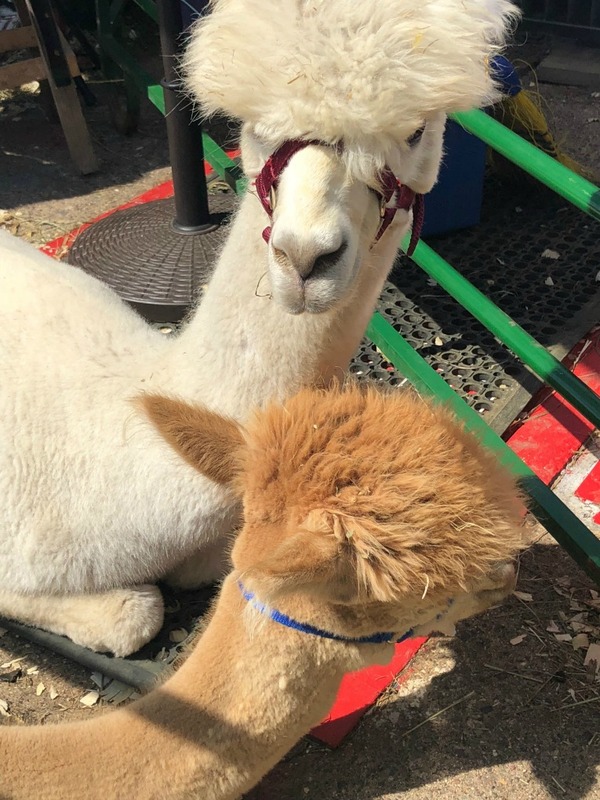 I love your fair photos – heart eyes at the alpacas, they are so cute! I know, if I lived outside the city, I’d want one as a pet 🙂 Some day! You had a great week! Congrats on the post injury mileage PR! It has been so hot and humid lately the long runs are a real undertaking. How fun to see T Swift with your nieces. Here I was thinking a rainbow cloud roll was some sort of sushi. Haha! Haha, yes, rainbow cloud roll does sound like sushi, but it was far from it! OMG..I need to try that cloud roll….lol Iay have to recreate that at home. Poor Matilda….i hate dropping .y dog off at the vets, especially when they are goi g to be put under. Glad she had Breck to keep her company later. He is such a handsome doggie! If you re-create the rainbow cloud roll, please post a picture on your blog! 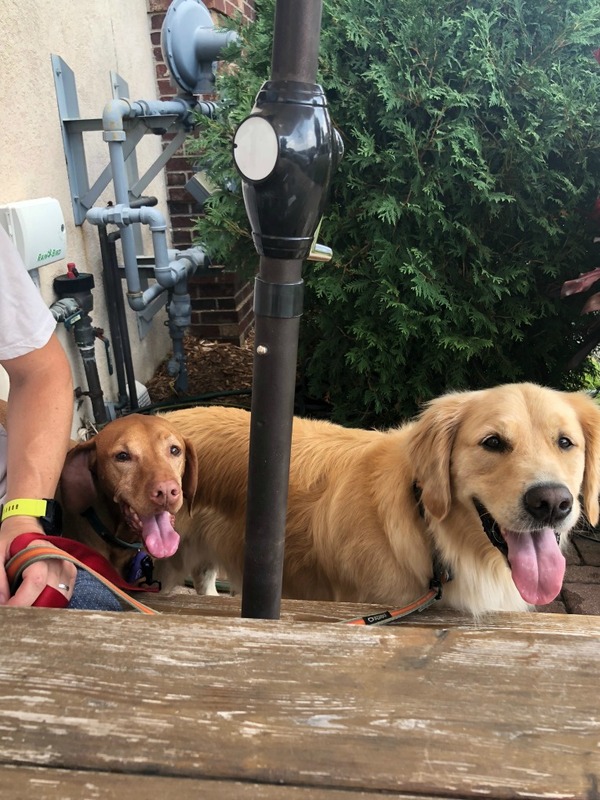 Breck is such a sweetheart, we always love having him visit! You had a great week (including the fair & all the food, LOL!). I’ve definitely never seen a cow give birth & probably never will. Great job on 12 miles! Congrats! Nice week and mileage! Your recovery/return to running has been amazing! And hooray for your longest run post injury! 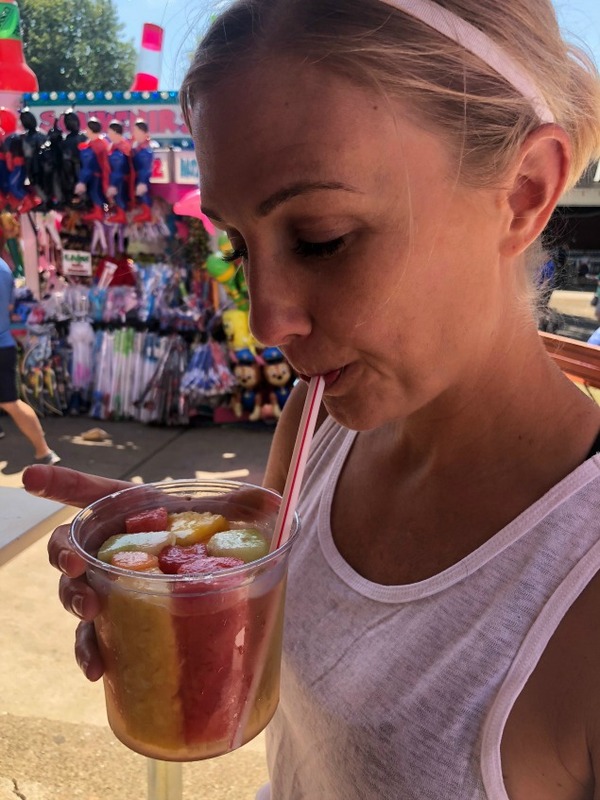 We’ve always liked going to our Fair mainly to try the weird, new food concoctions. I’ll now be looking for the Rainbow Cloud Roll. But, we do enjoy seeing the animals too. 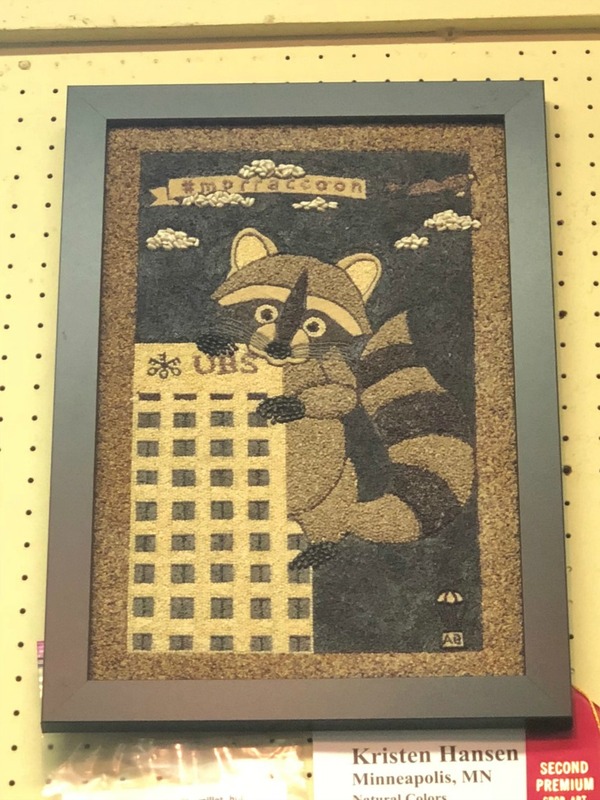 That crop seed art is very impressive. It reminds me of a project one of my kids had to do for school once. We worked so hard on that thing! 😉 Thanks for linking. Yes, the weird new foods are always fun to try! Thanks for hosting the link-up! Rainbow cloud roll sounds wonderfully awful. Love the public art on your run commute. Yep, that was my dog 🙂 Matilda! We call her lots of different names. I guess I haven’t named my treadmill yet though, I probably should! So I had to convert that 12-miler and it works out to 19 km!!!! What?! That must have felt quite amazing after the crazy injury you had! The speed will most definitely come back – just keep taking it one run at a time. What a lovely and happy post and that photo with you, your sister and nieces is simply beautiful. It sounds like a great week, both running- and non-running-wise! Thanks Vanessa! It was a fun one. Sad that summer is coming to an end! 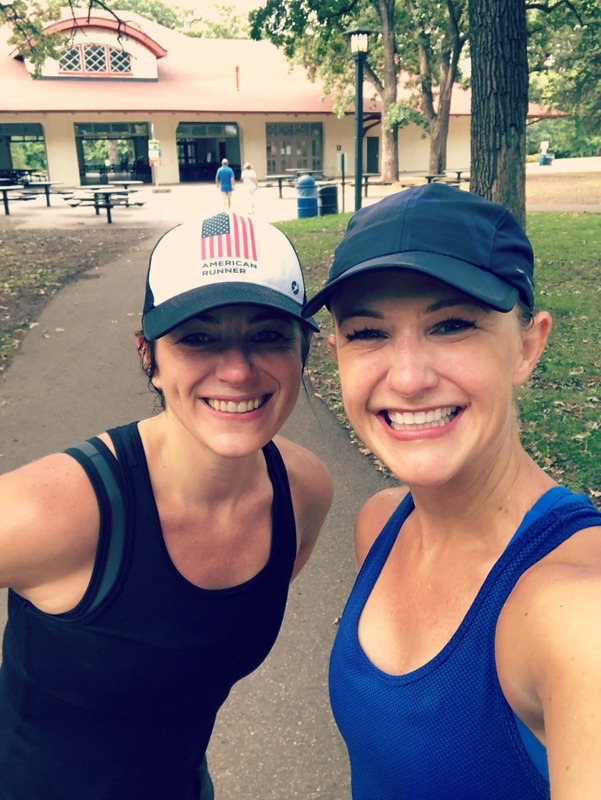 When I’ve been injured, it’s always been such a treat to finally reconnect with running buddies on a run. THere’s just so much more to talk about on a run! Congrats on a stellar week and a post injury PDR. Thank you Angela! 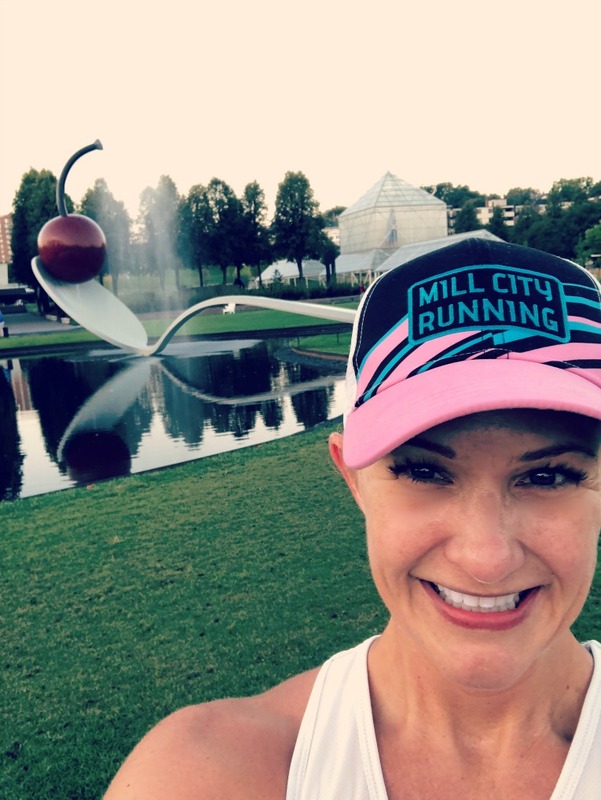 Yes, it’s been so great to reconnect with my running friends on long runs! Sounds like a busy week! The grilled peaches with goat cheese sound delicious. I’ve never tried that combo before.